We work with a wide range of stakeholders to ensure that the optimum water efficient or low carbon strategy is implemented within a building project, whether that be a single building or a whole development, new build or existing buildings. We work with the occupiers of the buildings as well as with the building itself. In a new build scenario we are usually a core part of the design team and should be involved as soon as possible, especially as we can now offer BREEAM and Code assessments through our associates, as well as a range of feasibility studies. 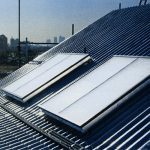 In existing buildings we undertake comprehensive carbon, water or energy audits of the building before advising on the best value and most effective sustainable upgrades. ech2o carried out a feasibility study for a brownfield site development of 10 flats to detail the options the developers had to meet the required Merton Rule of “10% of predicted energy requirements to come from on-site renewables”. 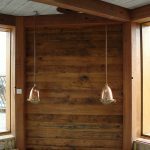 The flats were already partly completed by the time we were consulted and so our solutions had to take into account the existing layout of the flats and existing roof clutter, in order to deliver a workable and cost effective solution. PTEa and Galliford Try developers commissioned ech2o to carry out a feasibility study for greywater recycling in a refurbishment project for 136 flats in North London to meet the planning requirement to ensure water conservation. 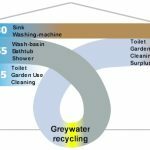 In a comprehensive report we explained the different greywater recycling systems available in the UK at the time, highlighting the advantages and disadvantages of each on this particular development. We calculated component and installation costs of the different systems and detailed the changes to standard waste and drainage layouts that would be required. 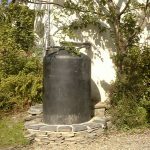 We showed that installing 4/2.6 litre flush WCs, 8 litres/minute showers, taps with reduced flow rates at kitchen sinks and washbasins, and collecting rainwater for use in the communal garden, would be far more cost effective, carbon efficient and save more water than installing greywater recycling systems. Savings to the developers for our solution was over £1500 per flat, whilst still delivering on the planning requirement. 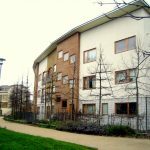 ech2o worked in partnership with Cambridge City Council’s sustainability unit to advise on the best way to make the new housing developments on the City’s southern fringe meet the Council’s requirement for SUDS and water efficiency. In the absence of a planning requirement to implement a sustainable drainage strategy, ech2o highlighted the advantages for developers of installing a variety of different SUDS solutions, and liaised with the Environment Agency to ensure solutions such as green roofs, rainwater harvesting and permeable paving, would reduce the amount of downstream attenuation required. We also calculated the water, carbon and monetary savings, as well as up front costs to the developers, for installing water efficiency measures, and/or rainwater harvesting systems across all the new sites. Cambridge City Council used the report to improve the water and carbon footprint of the southern fringe and to drive forward their sustainable water strategy for the whole of the city. Acted as a consultant on “Is Coke in trouble?”. Directed by Sapna Bhatia, this short documentary asked: “Is Coca-Cola stealing water from Indian communities? 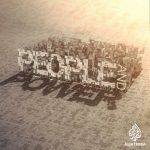 A look at why local people are speaking out, and what those at the top have to say in response.” The story involves Coca Cola’s bottling plant near the village of Kaladera in the state of Rajasthan, North India. We provided expert advice on whether the rainwater recharge system set up by the company would be able to offset the amount of water used by the plant in its day to day activities. Implemented a sustainable water strategy for Lambeth Council on Boatemah Walk, part of the Angell Town redevelopment project. Worked closely with Anne Thorne architects and Mendick Waring engineers as design consultant for the rainwater harvesting system for this block of 18 flats. Combined with 4/2.5 litre ultra low flush dual flush WCs an estimated 400m2 of water is saved from the building every year and over 90% of the stormwater is retained within the site boundaries. 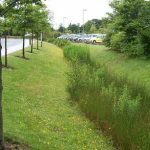 Worked with the Dublin Institute of Technology, providing technical support on two prototype rainwater harvesting schemes in the Republic of Ireland, one for new housing estates and one for existing farm buildings for agricultural use. ech2o are one of the core consultants for GreenSpec Consult, working in collaboration with other environmental experts across all disciplines to achieve the highest possible sustainability standards across the built environment. 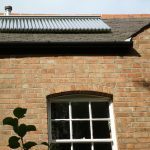 Reduced the carbon emissions from a detached house in Leicester by 50% by a combination of upgrading the existing insulation, specifying an A-rated condensing boiler and efficient controls, installing solar thermal and a 1 kW peak photovoltaic array. Bill Dunster Architects asked ech2o to be the services consultant on the refurbishment of a large four-storey house in North London that resulted in an 85% reduction in its overall carbon footprint. By working closely with the contractor, ech2o ensured that the low carbon solutions chosen by the client were integrated successfully into the services infrastructure. A wood pellet boiler will provide all the space heating load and the hot water heating load in the winter; solar thermal panels will provide all the hot water in the summer; photovoltaic panels and a roof mounted wind generator will provide over 50% of the electricity used by the occupants; a greywater recycling system, dual flush WCs, water efficient showers and taps and rainwater collection for the rooftop garden will reduce mains water consumption by 70%.